Eason started working with The Armstrong Law Firm, P.A., alongside her family in September 2015. A local of Smithfield, Eason returned home after graduating from Wake Forest School of Law in May 2015. Eason is a “Double Deac.” She graduated from Wake Forest University with a Bachelor of Arts in History and Religion in 2012. She knew she made a wise decision to continue her legal education at Wake Forest when she met her husband, Daniel, during her first week of law school. Eason welcomes the opportunity to be “Strong for You” in the courtroom. 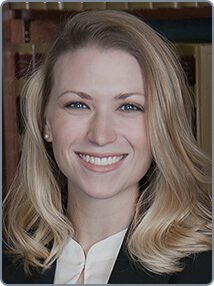 While at Wake Law, Eason honed her trial advocacy skills, participating in Litigation Clinic and Trial Bar, achieving the highest grade in Trial Practice, and receiving the North Carolina Advocates for Justice Award and the CALI Award for Excellence. Her leadership, editing and writing abilities landed Eason a position on the Board of Editors for the Journal of Law & Policy. Following in the footsteps of her mother, Marcia Armstrong, Eason handles a variety of domestic claims, from child support and custody to equitable distribution of marital assets. Eason is an active member of the North Carolina Advocates for Justice and the North Carolina Bar Association.